Nightrave greyhounds blog: Amichien Bonding, as explained in "The Dog Listener"
Amichien Bonding, as explained in "The Dog Listener"
How do you get your greyhounds to recall to you in offlead areas? How can you have them offlead, everywhere, and be confident they will come back when called? How come you can be so relaxed when you have 4 greyhounds running off leash , in a public park? How come they have both passed their Canine Good Citizen Assesment at the first try? How come your foster greyhounds are so well behaved, running around with dogs of all breeds, how come you can have a pack change pretty much every week with no issues? Don't Louie and Lucy get upset and sulk...? How on earth does your cat feel about it...? Do your foster greyhounds chase your cat? At first we found these questions quite funny...:) Sometimes we even thought they were a joke. But, as time passes, and more greyhounds get adopted all over NZ (YEY!) we find that people who ask us these questions are actually serious. More and more owners adopt our gorgeous hounds -and they want to give them the best life possible. However, some of them are genuinely puzzled and do not understand how the dog's mind and instincts work (and this includes some dog owners who have had dogs for years!). All these amazing dogs have gone on to their new homes. I myself have done many things in my life, but fostering greyhounds has been one of the most amazing, most fulfiling things I have ever done. 'AMICHIEN BONDING' (developed by Jan Fennell 'The Dog Listener'): KIND, GENTLE, NATURAL & GADGET FREE way of showing your dog(s) who the leaders are and defining (and improving) their behaviour by communicating with them using their own body language and actions, which they can understand, and is much easier for us the owners to learn, than it is for them to learn ours. Once applied ‘Amichien Bonding’ will help create a perfect, trusting friendship and should be seen, as with all forms of communication, as the perfect foundation for a wonderful future together. By using clear, concise & consistent signals in a calm way, you will be able to have your dog elect you as Alpha of its own free will. The Alpha is the strongest, cleverest & fittest member of dog's pack -and Amichien Bonding is based in this simple and natural fact. Your dog (ANY DOG, greyhound or not) will look to you to make the decisions regarding the survival of the pack and providing you are able to give it the answer it needs, it will believe and trust in you (it come back to you when called, be happy to accept new members of the pack coming and going, be great with other animals in the house., and in general will be a perfect family pet). Despite being based on Alpha leader's role, Amichien bonding rejects all thoughts of dominance and force and replaces them with respect, recognition of the world through dogs' eyes and the desire to get our dogs to want to work with us of their own free will. First I have to mention that there is a school of thought that advocates negative Alpha image, of someone who punishes dogs and rules them with an iron hand or something: I personally find this theory ridiculous and ignorant, as dogs are pack animals who see Alpha as A PROVIDER of food, LEADER of 'the hunt' (walk), PROVIDER of shelter, PROVIDER of safety , DECISION MAKER - or as I like to call it, the center of their world, the PROVIDER of love :). It is very very simple - DOGS NEED THIS PERSON TO LEAD THEIR PACK. If they do not have , or do not 'recognize' this person in the household, they get VERY STRESSED. And stress in dog, don't forget, manifests itself in different ways than in humans, because they are DOGS. Dogs are not your babies, they are NOT humans, and it is not fair to treat them that way. You can give them all the love in the world, like we do to our greyhounds, but as long as you remember they are dogs, and respect their identity. By seeing that almost all problems arise from a misunderstanding, once we appreciate that the dog is looking for a leader who cares for them, is kind to them and will step up to the role of leader when they experience concern or fear, we are able to bring magic to this relationship, with the simple adoption of a four part information system explained further below. 'Amichien Bonding ' is not a training per se, it is a WAY of 'talking' and giving signals to the dog. For example, we don't train any of our foster greyhounds to recall to us like some dog clubs do in Obedience Training etc - for us, recall simply happens in a week or two TOPS, as out and about, dogs want to do the best for the pack leaders (us), who are leading the hunt (walk). It is their NATURAL instinct, which we tap into. A dog who HAS his pack leader with him will NOT ever want to lead the hunt (walk), but he will follow and look out for his pack leader. Same with cat-training , toilet training, house training and whatever. Dogs WANT to do what pack leaders ask them to, and are THE HAPPIEST that way. Owners experience issues with their dogs when they have failed to give them clear signals that they are the leader, the Alpha, of their pack. This leaves the dog with no option, it has to assume responsibility, it has to become Alpha. It has to ensure the ongoing survival of itself and its pack. And as the dog reluctantly becomes the Alpha, in order for pack structure to work, he will HAVE TO see the other members of the household as lower pack members. This is their basic instinct. NO DOG wants this - no dog wants to be a pack leader, especially not a greyhound, who has had a great pack leader (his trainer) all its life!!! If i have to say ONE THING in this post, one thing that people should remember , it is this: THE LAST THING a newly adopted greyhound would want to is to arrive to his new home and take on a pack leader job!! :) How can he expect to succeed in this job? HE KNOWS he is in a new manmade world that it has no chance of understanding on its own and we have set it up for certain failure. His owners sometimes would have no clue about this -and put all the blame on the dog, which is unfair and completely wrong. IF there is no person who is a pack leader in his new home, the dog feels that he HAS TO take the job that he is not equiped to do - and it stresses him to no end. Stress in dogs manifests itself in toileting in the house, growling at people and other dogs, yapping hysterically, digging , destroying furniture, howling, separation anxiety , not coming when called etc. At the same time , while being stressed, dog is trying to do the pack leader job: leading the hunt (going off to the distance and not coming back when called), pulling on ther lead, refusing to walk on heel, having 'no ears', wanting attention on its terms, jumping on people (including his owners), telling other pack members off (yes, growling at family members) etc. This is WHAT PACK LEADER DOES. Dog is only doing the job that he HAS TO DO. It is not his fault -but the owner(s). Imagine yourself arriving in a strange building, and being TOLD you had to fly a plane from New Zealand to New York, TODAY. Imagine being told in no uncertain terms that you MUST do it TODAY. There are no options, no discussions, nothing -you are to fly that plane today. You don't have training for the job, you don't want to do it, chances are you are going to die and kill all the passangers in the process -but you have no option: you are going into that plane's cockpit and you are going to try to fly it. How would you feel? THIS IS HOW A DOG WITHOUT A PACK LEADER FEELS. And I am not exeggerating - I have seen dogs in this state, terrified, freaked out, stressed dogs nearly out of their mind. Again- remember: stress in a dog does not manifest itself as stress in a human, as i explained in the paragraph above. Success is very much dependant on the owners to carry out these four steps on a daily basis, as you are the ones who have to prove to them you are capable of the position of leader. "Dog Listener" is currently on sale on Fishpond.co.nz -this is another reason that I am writing this. 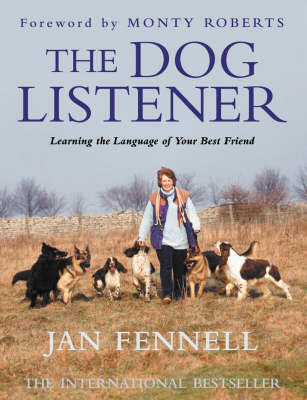 I personally think EVERY dog owner should read this book, and implement Amichien Bonding with their dog(s). If your new greyhound comes from GAP, it is important that you realize that this dog is NOT a rescue dog. He is a dog that comes from a racing kennel, a retired athlete who had a very structured life, with very defined pack order. During his racing career, he has had a VERY strong pack leader (his trainer) all his life, ever since he was a pup. THIS is what gave him security and routine, and this is what he knows and EXPECTS. Remember: when a new greyhound arrives to your home, it has NO IDEA where it is, what the pack members are, and who is the pack leader(s). The first thing it does is look for the pack leader or pack leaders, it will observe and try to figure out who this person is, as this person will give them SAFETY, which they crave being trust into the brand new (pet) world for them.